As with any part of your home, your septic system requires on going maintenance to keep it working efficiently and effectivley. Proper maintenance helps protect your land, your water, and your investment. There is daily maintenance of your system, in the way of regulating what goes down the drains in your house. Nothing except wastewater and toilet paper should go down your drains and your toilets. Garbage goes in the waste basket. This includes, kitchen food waste such as coffee grids, cooking oil or grease and bathroom waste such as dental floss, baby wipes, feminine hygiene products, and diapers. All these items can contribute to blockages in your pipes and problems in your septic tank. It is best to use liquid detergents for laundry and in the dishwasher. Powered soaps can leave build up in your pipes causing problems similar to plaque in a vein or artery. Be aware of running toilets and dripping taps, although it does not seem like much water the constant flow can over load the system and flood the tile field. Depending on the system it may require annual maintenance. Systems with special tile fields called tertiary systems are required by the Ontario Building Code to receive annual check ups and maintenance. These systems are systems that include Waterloo Bio Filters, or Ecoflos, among others. If you are unsure if your system requires annual maintenance, contact the manufacturer, or give us a call. Any system installed after 2006, and some systems before, have an effluent filter present in the septic tank. This filter is designed to filter out solid waste in the waste water and prevent it from leaving the septic tank. 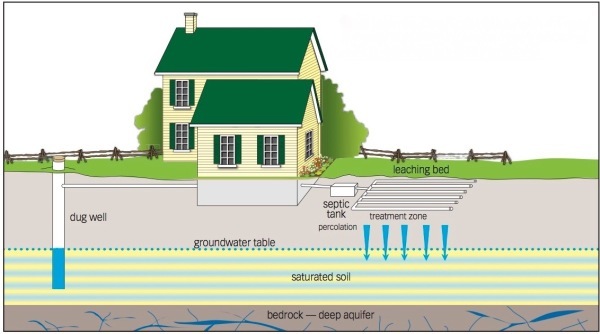 When solid waste that has left the septic tank it can contribute to clogging of your tile field. As with any filter, effluent filters requre cleaning to prevent clogging and obstructing proper flow of the waste water in the septic system. As septic tanks fill with solid waste over time they become less and less efficent. The solid waste breaks down very little over time so to mainten the system's effiency and prevent the possiblity of solid waste over flowing into the tile field the septic tank will need to be cleaned out. The time between septic tank cleanings (or pump outs) will depend on the age of the system, the size of the system and the rate at which it is being used. The older the system, and the smaller the system, and the more use it sees, the more often the tank will need pumped out. As a rule of thumb an aproprately sized system that services a full time use home requires pumped out every three years. Where as a part time use home's system requires pumped out every 5 years. If you are unsure how often your system needs cleaned out we would be happy to set up a pump out schedule for you. As with your car, your bike, and your home, your septic system requires maintenance that helps keep it working as it should and increases it longevity. If you have any questions about maintenance on your system please feel free to contact us. “Protect your land your water and your investment!"